When it is summertime and it is scorching hot outside, there are few beverages that really hit the spot. One of the most popular cold beverages during the dog days of summer is iced tea. Gone are the days when your mom made ice tea from a handful of tea bags in a boiling pot of water. Fast forward a few decades and the ways to make it and the number of varieties and flavors of tea equals that of its popular counterpart; coffee. Who has the time to brew a pitcher of iced tea or even more time with the longer method of sun tea? With the new iced tea and other brew over ice beverages available for your Keurig, you can brew a delicious glass of fresh brewed iced tea in seconds. I am a coffee drinker and I absolutely love my Keurig. I appreciate how easy it is to use, how fast it brews a fresh cup every time and how many flavors are available. 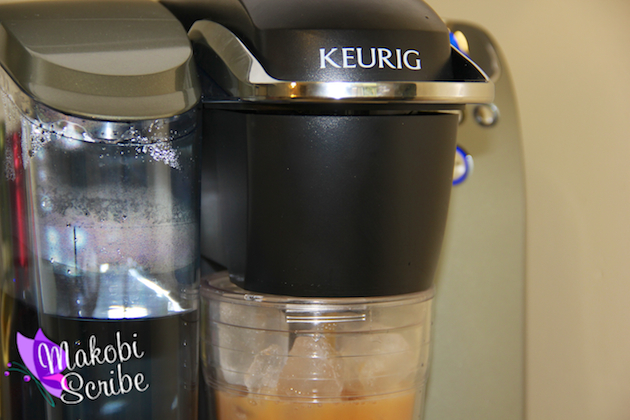 With the Keurig single cup brewing system, you can choose from the K-Cup, Vue or Rivo systems. For each system, there are a large variety of coffees and teas and now other beverages that are becoming increasingly popular, which are the brew over ice beverages. Currently the K-Cup system has the most varieties to offer, numbering close to 20. 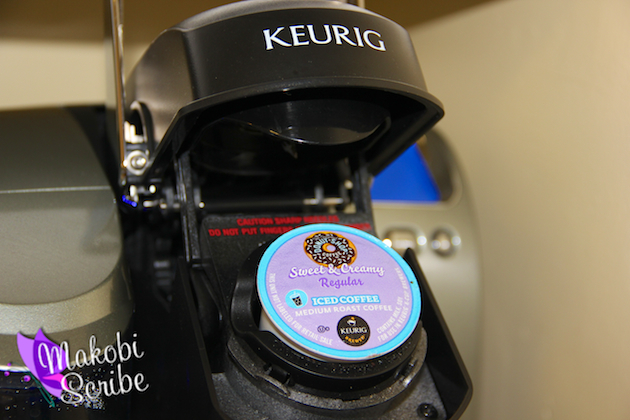 While at BlogHer13, a large blogger conference held in Chicago recently, Keurig had a booth and it was always filled with visitors. The folks manning the booth were offering full sized samples of their new brew over ice beverages and boy were people going crazy over them. Once I tried the Vitamin Burst Acai Berry tea, I understood why everyone was so excited. You can also choose from other flavors like Snapple Lemonade or Peach Iced Tea, Sweet Raspberry Perfect Iced Tea from Celestial Seasonings or the Sweet & Creamy Nutty Hazelnut Iced Coffee from The Original Donut Shop. 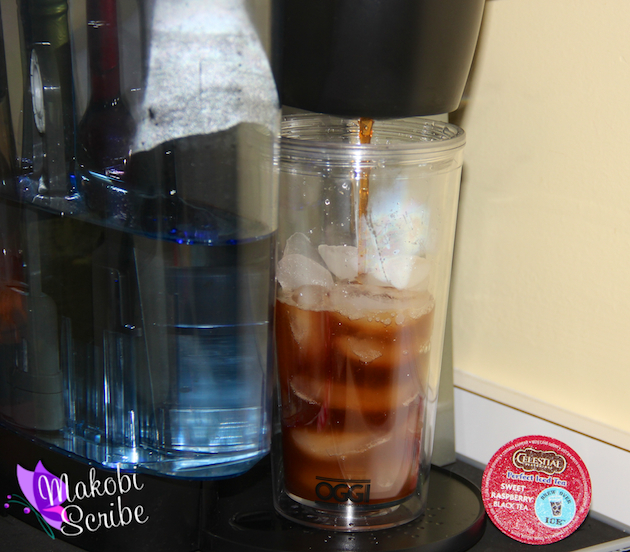 I use the Platinum Plus Brewing system, not only for my morning coffee, but for hot cocoa and the iced beverages Keurig now offers. The Platinum Plus Brewing system brews your hot beverage perfectly, one cup at a time in less than a minute. All you do is touch a button and you are on your way to a perfect cup or glass of your favorite beverage from the vast Keurig collection. The backlit LCD display makes it easy to program your water temperature, set the digital clock, Auto On/Off and your favorite cup size. It also has am instant rinse and dispenses hot water as well. You can choose from 5 different cup sizes and with the removable drip tray, you can even use your larger travel mug. You can purchase the brew over ice beverage k-cups in the 24 pack for $17.49 from the Keurig website as well as other fine retailers that sell the Keurig brewing systems, including the Platinum Plus Brewing system, which retails fro $189.99. Previous articleWhy Should We Recycle In The Bathroom?